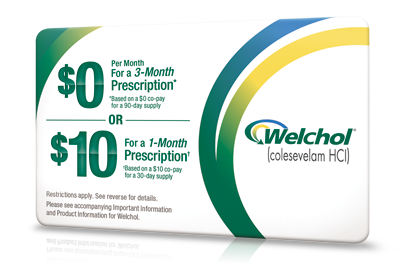 You can choose to either mix Welchol for Oral Suspension into a liquid form or to take Welchol in a tablet form. *Phenylketonurics: Welchol for Oral Suspension contains 27 mg phenylalanine per 3.75 gram dose. 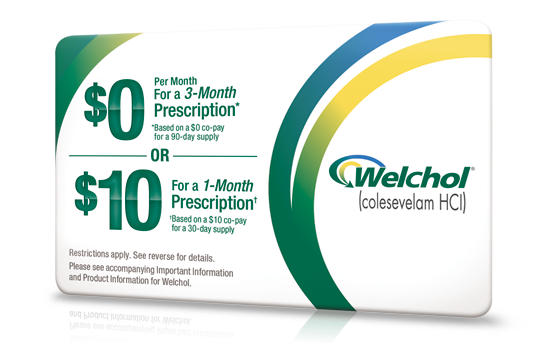 If you prefer, Welchol is just as effective in tablet form. Because of tablet size, Welchol Tablets should be used with caution in patients with swallowing disorders. Welchol for Oral Suspension is recommended for, but not limited to, use in any patient who has difficulty swallowing. Remember, it's Welchol plus eating right, exercising, and taking your current medications that could help you keep taking steps in the right direction. And take Welchol as prescribed by your healthcare provider. before making any changes to your diet. Keep moving forward with Welchol.